Dave Perry s home of vintage sportrods , vintage racecars, vintage kit cars, Victress sport rods, Ladawri kitcars, kellison kits, Devin vintage fiberglass body, Woodill Wildfire, Glasspar, and Early Fiberfab kit cars, Dave Perry began using fiberglass in 1954 and has seen many changes in the frp techniques. 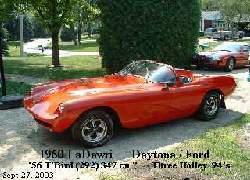 Fiberglass body repair and restoration of many vintage fiberglass body cars is Dave Perry s interest. Vintage Sport Rods and Race Cars return to the real world, through this shop in North Alabama. 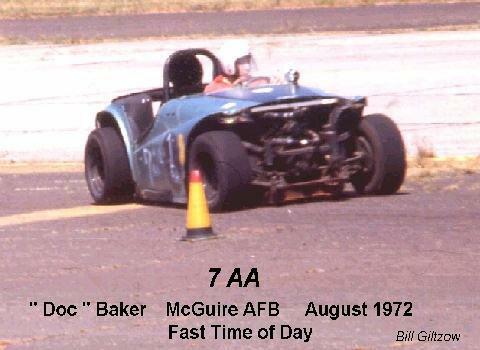 Beginning in the 50's, early ' kit car ' bodies , became the choice for builders of both Street Racers and Road Racing Courses on the West Coast, and this quickly spread to the East. 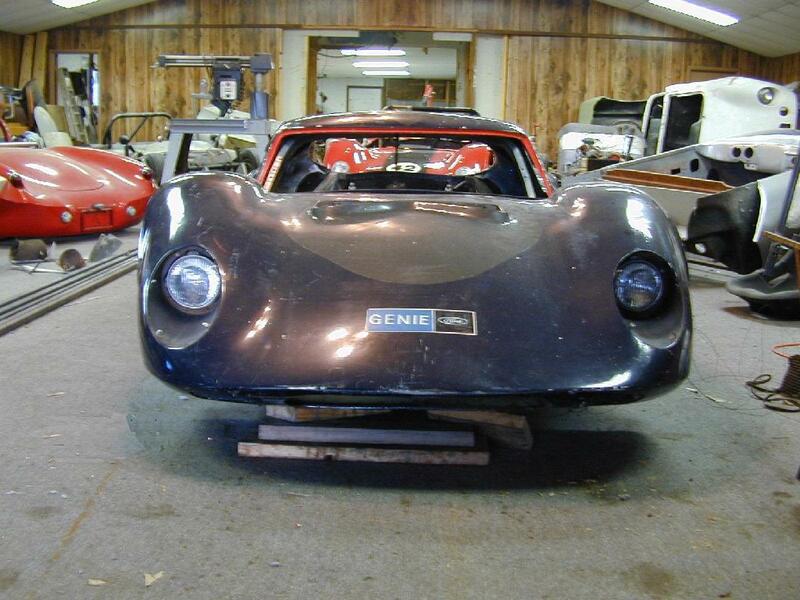 Devin, La Dawri, Kellison, and Victress produced kit car bodies that performed well on road courses, dragstrips, and the salt flats of Bonnevile, and led to a strong market in the mid 60's which was joined by Fiberfab, and Astra. 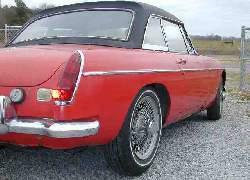 In 1959, putting a 283, Y-block, Nailhead, Lincoln, Caddilac, or Packard 352 into a lightweight car with a sporty body, started the trend that became the Muscle Car Era of the late 60's. Amongst race cars of the 40's, 50's, and 60's, you'll find these body builders well represented at this shop in North Alabama. Several frame-off restorations are always underway in the shop , and cars and bodies for future inclusion in the schedule are always on hand as well. LaDawri, Devin, Kellison, Victress, Tornado, Tipo 61 variant, and early Fiberfabs dot the parking lot. Email or calling ahead is suggested, as a very flexible schedule is maintained and daily hours of operation vary. Also, it is common to find the gate closed, even though work is being done inside the shop. The phone number is posted on the gate , for your convenience.
" AS BUILT" and " AS RACED" are the standards to which cars are completed, and other than safety ( such as dual brake systems) , remaining 'period correct ' is the #1 priority. Cars that at one time were completed , are the focus of most efforts, although a total build for an unusually rare original body may occur. There is also currently, a project to return the Ridenour GT " , the mid-engine USRRC/early CanAM coupe from 1965/66 to the racing circuit. Named in memory of California driver Dave Ridenour, who conceived this Genie/GT in the prophetic belief that coupes were in the future for the ' ground thumping' big bore road-racing cars. Dave was killed while racing in 1966. 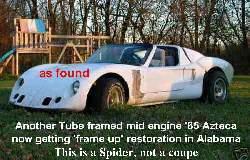 One of two known to still exist, this factory built tube frame, mid-engine spider with Corvair flat six power is currently undergoing a total frame-up restoration. This limited production, well maintained replica of Walter Glocklers pre- 550 Porsche Spyder design is currently undergoing a body off restoration, after about 20 years of much enjoyed high performance driving. 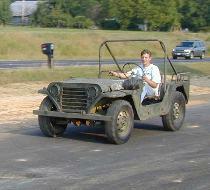 Do you remember this car ???? Found as shown in a barn in Vancouver BC , Canada. Construcion is typical of late 50's. 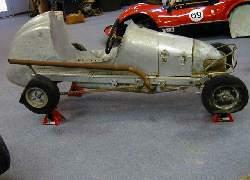 An early mid-engined true monocoque , very professional and sophisticated for the period. 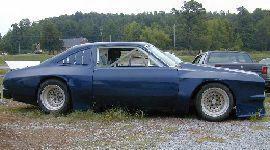 It last raced in the SouthEast with the body as found. 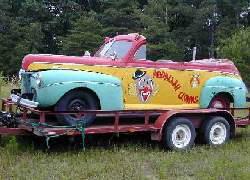 Other than the nose and tail , the car is unmolested from original.
" 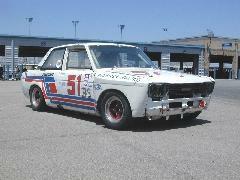 The Glassmakers 1960 "
Hidden away for nearly 2 decades, now back on tracks in the SouthEast during 2007, this authentic race car from the 1972 SCCA TransAm Series, and later IMSA Camel GT Series, and Valvoline Cup, is scheduled for a Fall restoration. Shell Oil's 376 mpg car in 1973 ! 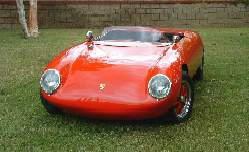 No Joke ...This car obtained 376 mpg on gasoline, in Shell Oil Company's 1973 Test, and is Internationally known. 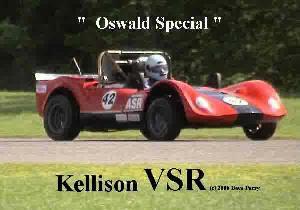 SOLD " Bob Oswald Special"...The only known, still existing, Kellison version of the early 60's Chuck Tatum designed VSR Sport Racer, is scheduled for a return to it's Vintage appearance after the current '06 racing season ends. Belongs in a museum....This car needs to go to the right home. Now generally owned by the Lodges, this one came from the builders estate.All the original Lodge graphics can be saved, as only the red and green need complete repainting ...will make an awesome street rod, certainly a " peoples choice" show winner anywhere. 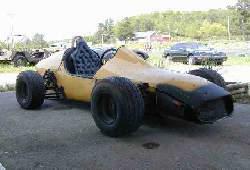 run but never raced, builders plate 5-27-90 , no engine now, will take ChevII or vw128 . Includes coupler to in/out box. no drysump tank which (was) is in pictures. Halibrand QC rear. Only a couple of dozen of these Euro models are in the US. 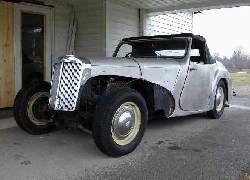 This one is in the Alfa International Registry 105.57.141.1185 .... Shipped to Europe. Aluminum bodied authentic California StreetRod. Needs no further explanation.